Met on arrival, comfortable room. Loads of extras included. AMAZING SHOWER. Location easy to get to with plenty food choices around. Well, 1A apartments are great. Apartment was clean, nicely arranged, and with affordable price. Location not too far from Alexanderplatz, connected with U ban, tram and bus. I recommend it to everyone! When I arrive in Berlin again I know where I will book my stay. The room itself was okay, and the location was great. Check-in was super smooth, even when I arrived early. In all my years staying in hotels (hundreds), I have never felt more welcome. The gentleman who brought the keys was an absolute delight. I felt like he was truly happy that I was there. This is not necessary - but it was certainly heartwarming! The room was larger than I expected, with high ceilings and a nice decor. The bed was extremely comfortable and also larger than I expected (I might have lucked out!). 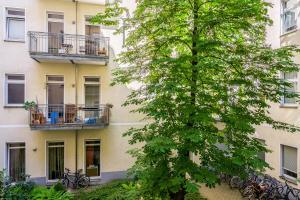 Fantastic location in a hip, safe neighborhood filled with iconic places to visit, restaurants, bars (Prenzlauer Berg). Excellent connection to all sorts of public transportation. Rooms were large and clean. We got a parking spot just near the apartment and the host was very friendly and helpful. Good value for money. 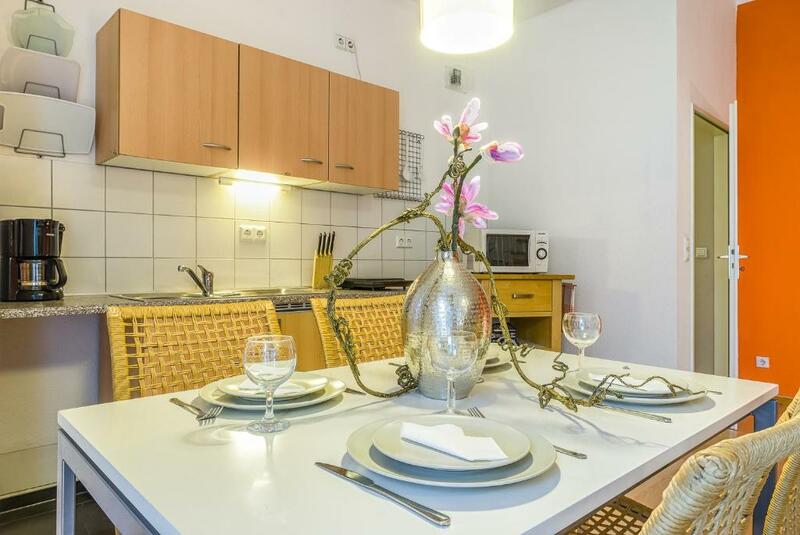 Stylish, large apartment in the perfect location for us. A great find. Check in was very convenient, even though we checked in after hours. Public transit was very close, as was a 24-hour grocery store. Great shopping nearby and lots of restaurants too. Close to the subway and lots of restaurants in the area. Coffee machine in the registration area was great. Plenty of space for three. Kitchen/dining in a separate room. Quiet street. 24 hour Grocery store on corner. Plenty of restaurants in walking distance. Close to transportation. 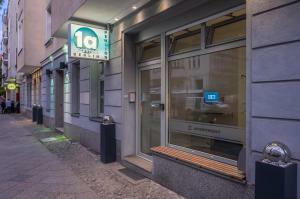 Lock in a great price for Hotel 1A Apartment Berlin – rated 8.3 by recent guests! Hotel 1A Apartment Berlin This rating is a reflection of how the property compares to the industry standard when it comes to price, facilities and services available. It's based on a self-evaluation by the property. Use this rating to help choose your stay! Offering rooms and holiday apartments, free WiFi internet, and easy transport connections, this family-run hotel lies in the trendy Prenzlauer Berg district of Berlin. Hotel 1A Apartment Berlin offers rooms and apartments featuring digital TV and a separate bathroom with a towel included. The rooms also feature a fridge and the apartments are equipped with a kitchen. Bed linen is provided and the rooms are cleaned daily. 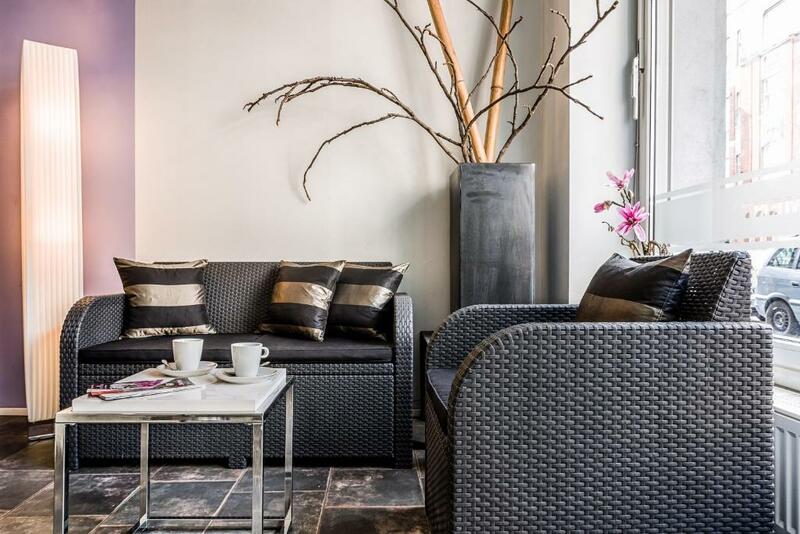 Guests are welcome to use the free tea and coffee facilities in the lobby of the 1A Berlin. There is also a free computer in the lobby. The Eberswalder Straße Underground Station is a 4-minute walk from the Hotel 1A. Direct trains run to the famous Alexanderplatz square in just 10 minutes. The Schönhauser Allee City Rail Station is a 10-minute walk away. 뀐 Located in the top-rated area in Berlin, this property has an excellent location score of 8.9! 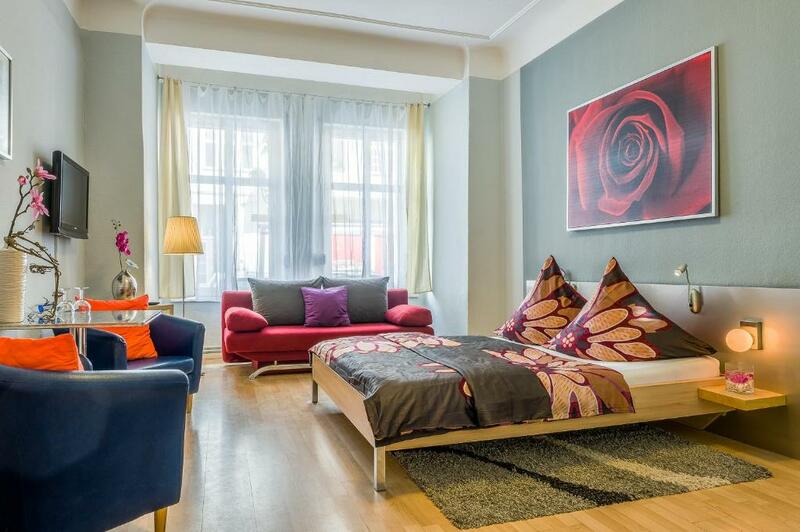 When would you like to stay at Hotel 1A Apartment Berlin? Bright room featuring a TV with digital channels, a fridge, and a private bathroom. Fresh bed linens and towels are included in the room. This room also includes a comfortable sitting area. Features a fully equipped kitchen and spacious bathroom. This apartment offers 1 sofa bed and 1 large double bed. Wir möchten gern anders sein als gewöhnliche Pensionen. 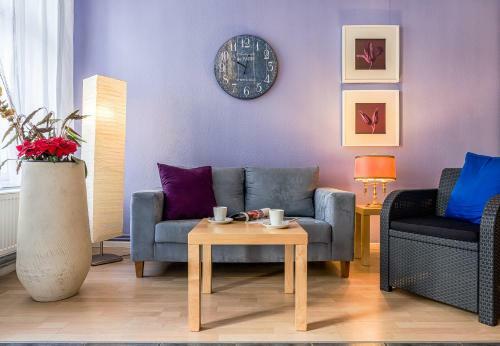 Modern und geschmackvoll eingerichtete Zimmer ist für uns mehr als eine Vorgabe. Ob es die großen King-Size-Betten sind oder die geräumigen Apartment-Zimmer mit einer komplett ausgestatteten Küchenzeile. Ein entspannter und zufriedener Aufenthalt ist das oberste Ziel für uns. - Anreisen nach 22:00 Uhr sind nur mit vorheriger Absprache und der Bestätigung durch die Pension möglich. Dabei wird ein einmaliger Aufschlag von 15 Euro fällig aufgrund der besonderen Personalanforderung. - Anreisen nach 24:00 Uhr sind nicht möglich. Der Betreiber besitzt Erfahrungen im Bereich Hotelerie seit 2003 und ist Besitzer dieser Unterkunft seit 2006. Die Pension ist sein Leben und er lebt für die Pension. Er und seine Mitarbeiter kümmern sich um alle Belange ihrer Gäste. Unsere Pension liegt im Herzen des Bezirks Prenzlauer Berg. Ein hervorragender Ausgangspunkt für kulturelle Aktivitäten, zum Shoppen, für kulinarische Erlebnisse in internationalen Restaurants. Zum Alexanderplatz sind es circa 5 Minuten mit der U-Bahn. Area Info – This neighborhood is a great choice for travelers interested in atmosphere, convenient public transportation and culture – Check location Great location - show map Guests loved walking around the neighborhood! 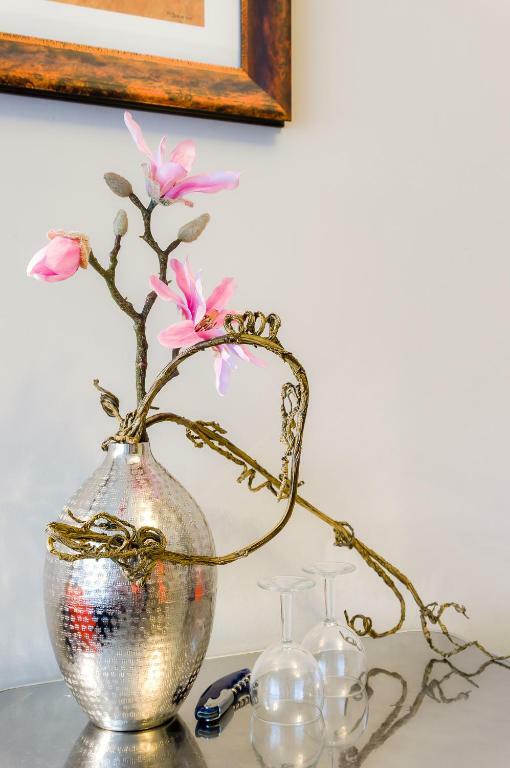 House Rules Hotel 1A Apartment Berlin takes special requests – add in the next step! Hotel 1A Apartment Berlin accepts these cards and reserves the right to temporarily hold an amount prior to arrival. Please note that an environmental sticker (Umweltplakette) is required for parking within Berlin city center. Please also note that the images are only examples and a reservation of a specific room cannot be guaranteed and is subject to availability. 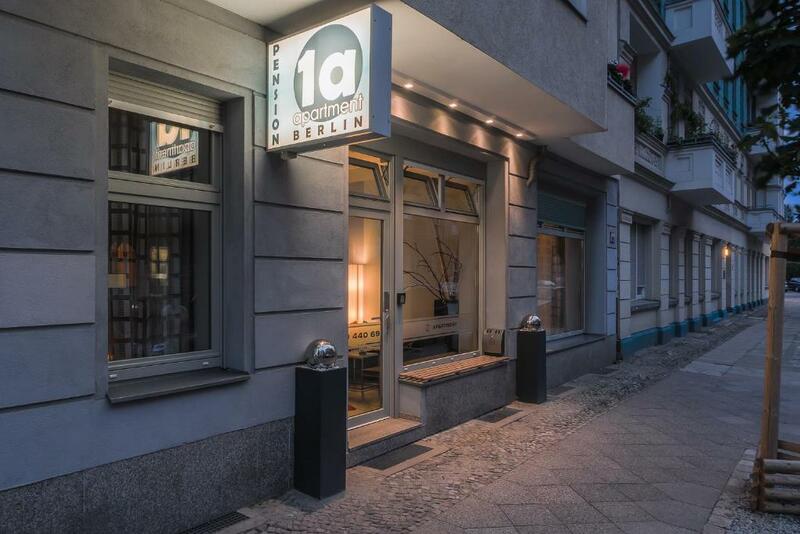 Please inform Hotel 1A Apartment Berlin of your expected arrival time in advance. You can use the Special Requests box when booking, or contact the property directly using the contact details in your confirmation. Not enough cookware.... for e.g there.was a Crepes pan but didnt fit the induction plate. 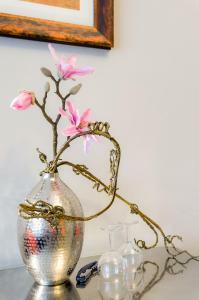 The owner was very accommodating and friendly. Small fridge, very old television. Lack of plates and cutlery in the room - only glasses. Very good location, near the underground and railway. Near to city live of pubs and small restaurants. Calm neighbourhood. Often room cleaning. Free coffee and tea for guests. Little welcome note in the room and chocolates left there! Check in situation was a bit odd. I arrived at 6pm and no one was around. Lucky I had a local SIM card, because the intercom wasn’t working. Once checked in though, all went well! Nice room and the location was great! There was a coffee machine but it was available only in the morning. Location was great, city center is about 10 minutes away. The bathroom was really small but it was okay. There is a 24/6 open market but be aware it is closed in sunday. Overall it was a quite nice place to stay and I highly recommend it. Very ugly room with cheap furniture. Not at all the room on the picture we thought we booked. Very noisy with a dog in the room next to us that barked the whole time. No curtains to close to block light and no privacy since we were on the ground floor!! The bed was terrible. I am 1.78m tall and my feet hung over the bed. My husband could not sleep at all. I liked it when I could leave the property! The room was very confortable and the manager very kind,very beautiful please to stay and enjoy Berlin. Uncomfortable pillows. Needed more toilet paper. The room was warm, practical for 1 person and it had all the essentials. But they need to improve some details in order to be better.The free towels, for example, although they were clean, they seemed so overused. And also the room and private bathroom were clean, but some surfaces that were not used often were a bit dusty. Friendly staff, the location (1km from Alexander Platz), right next to the hotel there is a mini market, 100m away from the metro. Free coffee in the lobby all day long. Comfortable, spacious room, close to several types of public transport. Key pick-up was easy. i recommend that place for sure.